The Earl of Mar Estate lies within a 240-acre wooded property on the south bank of the River Clyde, to the west of Glasgow. The centrepiece of the estate is a substantial building that was formerly named Erskine House (designed for the Blantyre family by Sir Robert Smirke, the architect of the British Museum) and it was constructed between 1828 and 1845. The magnificent old baronial mansion was completely refurbished and it reopened in 2006 after a multi million pound refit as the 5-star Mar Hall Golf and Spa Resort, its new name recalling the former ownership of the estate by the Earl of Mar, holder of one of the oldest peerage titles in Europe. 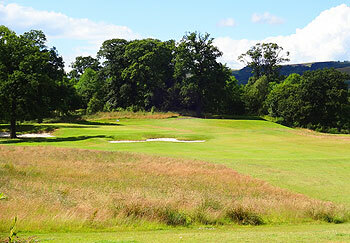 Dave Thomas designed the estate’s new golf course – adding another 18-hole layout to a bourgeoning Scottish course portfolio that now includes The Roxburghe and Cardrona in the Borders, Newmachar and Spey Valley to the north – and play got under way here at Mar Hall in the summer of 2010. As you might expect at a resort location, the emphasis is on playability, with generously proportioned fairways and large, gently contoured greens throughout. With an overall length of no more than 6,507 yards from the back tees, the Earl of Mar golf course appeals to the strategically minded golfer through the clever integration of mature trees in the design. Laid out in the shadow of the Erskine bridge, the fairways are parkland in nature, configured as two loops of nine holes, each of which return to the front of a proposed new clubhouse that will sit above the fairways, between the River Clyde and Mar Hall, facing across to Bowling and the Kilpatrick Hills beyond. Initial memberships are targeted toward the corporate sector but attractive stay and play packages are available, along with daily green fee rates for individuals or small groups of golfers. I played Mar Hall in autumn 2018 with a good friend. We both enjoyed the course and the layout. We found the course to be very enjoyable to play, it lived up to every yard as we found it very soft going. Drives were not rolling too far and on some of the longer holes we really noticed the difference. The greens were in good condition and the balls rolled reasonably well. As to be expected the rough was thick and pretty tough to get a good strike out of it. The course has the feel of most modern parkland tracks. We got the green fee on a mid week rate so it was reasonable. Solid and enjoyable all rounder. We were fortunate to play the Earl of Mar on the sort of Scottish summers day you always hope for and therefore we saw the course, it's location and the grand Mar Hall hotel/clubhouse at its best. Earl of Mar is a very convenient location positioned around 20 minutes from the centre of Glasgow and 10 minutes from Glasgow Airport and it portrays the true appeal of playing golf in Scotland as it feels a world away from the city. Earl of Mar is located on the Banks of the River Clyde and has the stunning back drop of the imposing Kilpatrick Hills on every hole. In fact much of the course plays alongside the water on what is a relatively tight strip of land. The Erskine Bridge shadows the course as you play between the third and fourth hole and is an added back drop to the course. Earl of Mar starts with a good par 5 where the drive has to be threaded through a tight line of trees to where the fairway opens up from where you can see the slightly elevated and will protected green. The second is a great par 3 and typifies the strength of all the short holes. From the back tees a number, including the 2nd, are around 200 yards and demand accuracy with a combination of well protected bunkering and some with good undulations (the shorter tenth an example). The third and fourth are both par 4's and complete a very strong start to the course. The third hole is all about the positioning of the drive where if you can catch the slope you are leaving yourself a short pitch to the green. The fourth is the first of the holes beside the river and it tees off under the Erskine Bridge. This is a challenging par 4 and is both long and well guarded by bunkers and a small lake that runs the length of the left side of the fairway. Strategic placement of mature trees dictate the playing of holes 7, 8 and 9 as you return to the start before the second nine loop. We actually enjoyed the back nine more than the first and it was principally defined by a series of excellent par 4's of greater length than 400 yards. The 11th, 12th, 16th and 18th are all strong examples, but as you move back towards the water you play the delightful 14th, a shorter par 4 played from a slightly elevated tee which invites a strong drive to a wide fairway from where the green opens up. Respite comes at the par 5, 15th when the long hitters can reach the green in two, but the final 3 holes offer a tough finish. I wasn’t going to post anything for my third visit here today as I’ve already submitted two reviews but then I noticed the last reviewer had only given the course one ball, which is grossly unfair. I live seven miles from Mar Hall and I can tell you MOST courses in the area will be largely unplayable in November - I don’t care how good the package deal might be at Mar Hall or anywhere else in the Glasgow area, avoid inland golf like the plague and head to the coast between November and February! This is a terrific track where, every time I’m here, I enjoy the playing experience a little bit more. Even the stretch from 11 to 13 went up in my estimation today as it really is a demanding three hole sequence with each of the fairways playing to tough, elevated greens. It may still be a wee bit immature and it might be a tad “too corporate” for some but Mar Hall’s a well constructed, modern course that offers a fine test of golf to those who can appreciate it for what it is. Stayed at Mar Hall over the first weekend of November 2012. Usually play a Links Course for our annual trip but read so much about this place and the package deal was quite good so thought we would give it a go.Hotel was excellent if a little expensive - £15 for a Club Sandwich I recall but the rooms and facilities were very good. The bar staff found it difficult to itemise bills but were otherwise pleasant enough. Now on to the Course - it's a summer course of that there is no doubt. The greens had been hollow tined two weeks previously and we had been assured that it wasn't too wet and they had recovered well - this was a lie. It was aqua golf on the Saturday and the course should have been closed as it was flooded in many areas and there was no relief from casual water even on the fairways - so much so that we teed it up on the Sunday.The greens were as bad as I've played - there is nothing else to say, they were terrible and I'm being generous with these comments believe you me !Won't be rushing back and have learnt my lesson - Links golf every time, every trip, every year ! I set out on a damp and breezy morning to tackle this lovely parkland course. The test is on straight away as you play uphill dogleg to the distant 1st green. 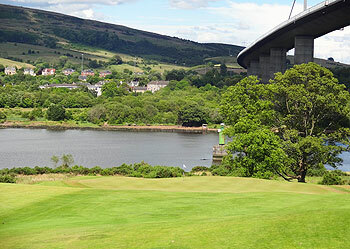 The downhill dogleg 3rd is interesting as it sits right beneath the erskine bridge! The quality of the greens was good and althoughthe bunkers were large, they were not too difficult to escape from. 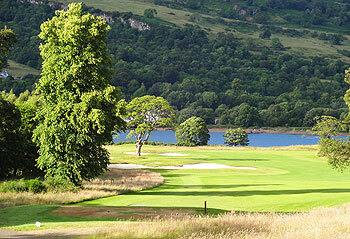 The 6th hole is lovely, as you play alog the banks of the river clyde. What i didn't like about the course were the holes where great mature trees were situated right in the middle of the fairway, as thisd cost me one or two strokes. The long par 4 11th (stroke index 1) is where I did best, firing a 4 iron approach on to the green to get a well deserved par. The dogleg 14th, playing towards the river was another good hole, as I gained my 4 again. The course is over 6,000 yards and is a strategic test for any golfer. The facilities in the hotel were excellent, and I enjoyed my day on this Dave Thomas course. Having an in-builtf suspicion both of new developments and Dave Thomas designs I approached Earl of Mar with a degree of trepidation. I should not have worried. On a beautiful, still April morning the front nine was quite splendid. There are no weak holes with several standouts: the dogleg 3rd with its green right under the Erskine Bridge, the 4th with water down the left, the terrific 7th with large trees dotted along the fairway and the 9th complete with sloping green.There is no doubt that the front nine is much the better of the two halves. After the cute wee 10th there is a hiatus with three poor holes where the lesser quality of the turf is in keeping with the unimaginative layout before things get back on track with the fine downhill 14th. In the closing stretch only the quirky 16th lingers in the memory.The grandeur of the front nine easily merits Earl of Mar five balls. I had the opportunity to play here again today - only ten months after I first reviewed Earl of Mar as a brand new course -- and I must say I’m really glad that I returned so quickly. I’ve changed my opinion on the left doglegged 3rd which tumbles down towards the river (probably because I wasn’t stymied behind a tree this time?) as it’s a visually stunning hole that’s way better than I remembered from last time. The wonderful 7th really is a cracker, with its pair of imposing trees in the fairway barring easy access to a two-tiered green surrounded by three bunkers. The 9th is another great hole, played uphill to a raised, wickedly contoured green, ending the front nine with a flourish. In truth, the back nine doesn’t really get the pulse racing for a bit and holes 11 to 13 are not quite as aesthetically pleasing as those already played - but maybe that’s just my skewed perception because the first two of this trio are pretty tough, ranked stroke index 1 and 3 on the card. The doglegged short par fours at the 14th and 16th were just as engaging as I’d found them the last time, with the latter snaking sharply left to an interestingly-contoured, shelf-like putting surface. Overall, I think the trademark Dave Thomas mounding and bunkering (that I’ve found slightly irritating on some other courses) has been incorporated into the design in a very sympathetic manner and the greens -- most of which are enormous -- were a little on the slow side again but still a joy to putt on. I know the set up here is heavily geared towards the corporate sector but ordinary club golfers in the Glasgow area and beyond are missing out if they overlook this place, especially as there are very attractive twilight green fees on offer. I was a visitor at Mar Hall yesterday, playing it for the first time and I must say I was very impressed with what I found.As a 3 handicapper I found this an excellent test. Although not the longest course accuracy is crucial with the way the course has been laid out with well positioned bunkers and existing mature trees which must be negotiated. Having said this there are still a few long par 4's with demanding second shots.The greens are excellent, large and undulating and for such a new course they ae in fantastic condition. They are among the truest I have played on anywhere in Scotland this year and I imagine they will be even better next summer when they get faster. All in all I was very impressed with this new course and look forward to playing it again. When crossing the Erskine Bridge to attend my own nearby course I used to glance down with envious eyes at what appeared to be a spectacular new layout. I expected some kind of Weiskopf design that was going to transport me half way to Loch Lomond. The location and surroundings are ideal. The river, passing ferries, bridge, background mountains and grand old hotel all combine to create an appetising atmosphere for golf. Complimented with an extremely warm welcome and a helping hand to load our buggy. Nothing wrong so far. A very well conditioned practise green (albeit located within the shade of some enormous trees) that offers every conceivable form of putt and a decent practise range both continued to feed my expectation levels. Then we get to the course itself where I am afraid that abject disappointment settles in with almost immediate effect. The condition of the 1st fairway is nothing short of embarrassing. There appears to be a significant amount of drainage works recently undertaken and perhaps the poorly kept ground in this area was a consequence of these works. Either way, considering the green fees, it is not good enough. A nicely designed hole spoiled. Moving to the 2nd, I would agree with the previous review that this is the best of the par 3’s. However, this isn’t much of a compliment as collectively they can be considered uninspiring and bland. A missed opportunity and major disappointment. The short 10th being the biggest of all. I thought the 3rd hole was the most exciting Tee shot on offer. A dog leg to the left falling towards the River with the Erskine Bride looming in the background. The optimum Tee shot demands a draw between two large trees about 150 yards away. If pulled of successfully you can expect a short downhill pitch but be careful not to overshoot the green or there is plenty of trouble to be found. I’m afraid that after this hole there is nothing memorable until the 11th. A classy par 4 considered the hardest on the course where accuracy is at a premium. That is it. Four memorable holes for the best part of £100. I’m left focusing on the negatives of which there are plenty. The course is as rough as Tarzans feet in places. I’m presuming that this is down to teething problems and will be ironed out in time. Still.... There isn’t a bin or ball cleaner to be found on the back nine. The greens are covered in Debris in July. The course is noisy due to the wedding celebrations and calia in the background. Although the greens are immaculate they are soft and spongy and run slow. Although I want to be, I am not at all impressed with the course at all. The reality is that there is a heavy concentration of decent inland courses within a ten mile radius (Hilton Park, Windyhill, Renfrew and Ralston) of Mar Hall that offer a better days golfing and a more reasonable price. Mar Hall’s major problem is that there is nothing on offer (with the current package) to encourage repeat business and I genuinely fear for its longevity.